Jaisalmer, August 20: India for the eighth time has successfully tested Anti Airfield Weapon (SAAW), which is capable of destroying a variety of ground targets using precision navigation. 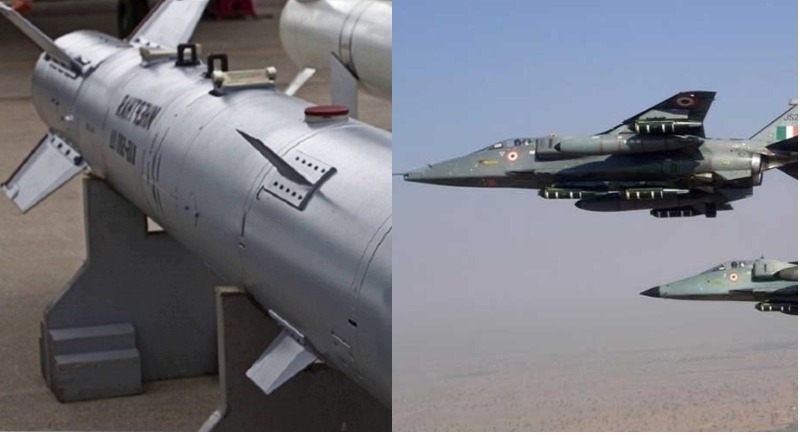 Notably, the indigenously designed and developed guided bombs Smart Anti Airfield Weapon (SAAW) were successfully flight tested from IAF aircraft at Chandan range in Pokhran, Rajasthan. The weapon has undergone eight developmental trials till date and performance of a system for different ranges under multiple launch conditions has been demonstrated. The weapon system was integrated with a live warhead and has destroyed the targets with high precision. The telemetry and tracking systems captured all the mission events. This weapon is capable of destroying a variety of ground targets using precision navigation. A total of three tests with different release conditions were conducted from 16 to 18 August 2018 and all the mission objectives have been achieved. Senior officials from DRDO, HAL and Indian Air Force participated and witnessed the flight tests. Raksha Mantri Nirmala Sitharaman congratulated the DRDO, IAF and HAL on the successful flight tests for further boosting the defence capabilities of the country. Earlier, in the day, DRDO successfully test fired the indigenously developed helicopter launched Anti-Tank Guided Missile ‘HELINA’. Smart Anti-Airfield Weapon (SAAW) is a long-range precision-guided anti-airfield weapon developed by India's Defence Research and Development Organisation (DRDO). It is designed to be capable of engaging ground targets with high precision up to a range of 100 kilometres (62 mi). The SAAW project was approved by the Indian government in 2013. The first successful test of the weapon was conducted in May 2016.